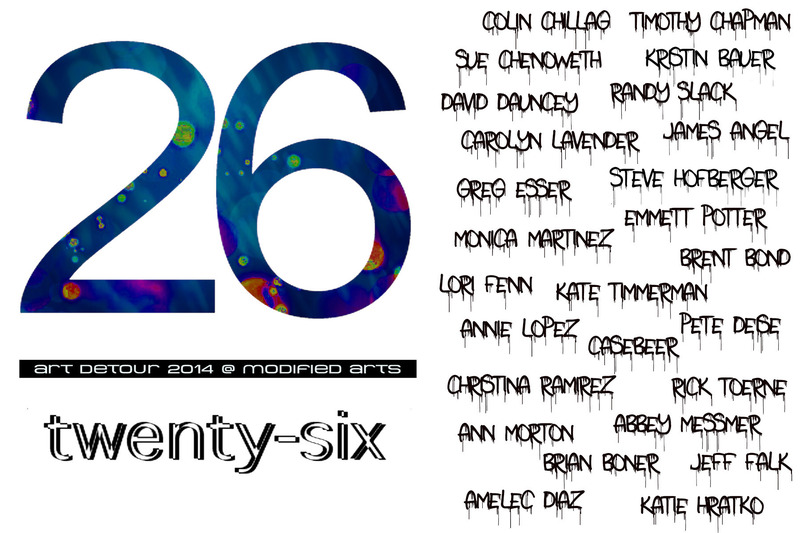 In honor of Art Detour‘s 26th year, James Angel continues his tradition of blockbuster showcases at Modified Arts, this time bringing together a group show of 26 of Phoenix’s best artists. For nearly a decade, pop-inflected painter James Angel has brought his best to Modified Arts during Art Detour for a solo show. This year, Angel has offered up the floor to some of his most talented friends and colleagues, spanning multiple generations and media in the Phoenix arts scene. From the deconstructed realism of Colin Chillag’s now nationally-recognized paintings, to the mixed-media commentaries of newcomer Amelec Diaz; the New York Times-profiled anatomic magical-realism of Monica Aissa Martinez, to the pop-inflected poetry of Kristin Bauer. Angel even delves into sculpture with the monumental, varnished work of veteran Pete Deise, and the fabric work of recent Phoenix Office of Arts & Culture grantee Ann Morton. Together, this show seeks to represent the eclecticism and power of the local scene during its Super Bowl: Art Detour weekend. Art Detour is an annual, weekend-long, self-guided tour of studios, galleries, art spaces, and arts-related businesses throughout central Phoenix. Now in its 26th year, the Artlink-organized event features over 100 participants for its latest iteration. Art Detour will take place Saturday and Sunday, March 8 and 9, from 11am-5pm.